The astronomer and historian Dorrit Hoffleit has noted that by the time Antonia Maury entered Vassar "she was probably better prepared for science than any other student." Born in Cold Spring, New York, on March 21, 1866, Antonia Caetana de Paiva Pereira Maury was the daughter of Reverend Mytton Maury, a protestant minister and naturalist, and Virginia Draper Maury. Named after her Portuguese maternal grandmother, Antonia Caetana de Paiva Pereira Gardner, the daughter of the court physician to John VI of Portugal and Charlotte of Spain, Antonia was descended from distinguished teachers and scientists. Her father's great-grandfather, Reverend James Maury, was the teacher of three American presidents—Thomas Jefferson, James Madison, and James Monroe—and she was the granddaughter of John William Draper and the niece of Henry Draper, both prominent physicians and pioneering astronomers in celestial photography. In 1840 her grandfather had made the first daguerreotype image of the moon, while in 1872 her uncle made the first photograph of a star, Vega, showing absorption lines—dark lines in the star's spectrum caused by the absorption of hot gases as they cool. On her father's side, Commander Matthew Fontaine Maury, the first director of the United States Naval Observatory (1842-61), was an astronomer and oceanographer, known as the "Pathfinder of the Seas". Antonia and her siblings, Carlotta Joaquina and William Draper, were exposed early on to scientific inquiry and to the classics. "At the age of four," Hoffleit observes, "little Antonia is reputed to have helped her uncle, Henry Draper, in his laboratory by handing him the test tubes he asked for in his chemical experiments. At nine her father had her reading Virgil in the original…." And all three siblings went on to distinguished careers: Antonia as an early astrophysicist, Carlotta as a paleontologist, and John William Draper (who dropped "Maury" in adulthood) as a physician, surgeon, and professor. At Vassar, of the 24 semester courses that were required for graduation, Antonia took eight semesters of astronomy, five in English composition, two in philosophy, and one in history. One of 19 students in Maria Mitchell's junior class in 1886-87, Maury distinguished herself in the lecture presentation that was a class requirement, lecturing on comets. "These lectures," Mitchell noted, "were mostly written and were all grave and carefully considered papers; they were well listened to; the period was 40 min." 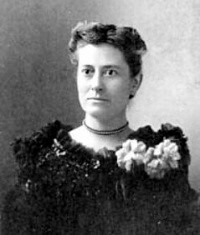 Maury, who graduated in 1887 with honors in physics, astronomy, and philosophy, had written on "Hints of National Character in Language" in The Miscellany in October of her senior year. 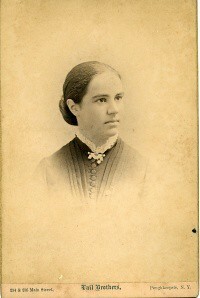 She and fellow astronomer Margaretta Palmer were among the seven graduates who delivered addresses at Commencement. Maury spoke on "The Ideal in Science," opposing, as The Vassar Miscellanys summary put it, "the prevalent notion that Science is in direct conflict with the tendency of the age to idealize, maintaining that Truth, the ideal of man, is the same, whether we seek it without or within; and that Science really teaches us to believe in the Ideal." When she returned to Vassar in the spring of 1896 to attend the astronomy department's traditional dome party, Antonia Maury presented a poem celebrating her time at the Vassar Observatory and describing the surrounding natural settings and the sense of freedom she had felt at college. She was perhaps contrasting her undergraduate freedom with the routine toil she had found in the next phase of her career. In 1882, Mary Whitney, Maria Mitchell's student—and, in 1889, her successor at Vassar—had published an influential essay, "Scientific Study and Work for Women," in which she suggested that scientific training would lead women to "useful, and, I hope, in the future, remunerative labor." About the same time, Edward Pickering, an advocate of women's advanced study and the recently appointed director of the Harvard observatory, dissatisfied with computational work done by his male assistant, turned the task over to his Scottish housekeeper, Williamina P. Fleming. Fleming's success led to his employing—under her supervision—twenty other women "computers" between 1885 and 1900. 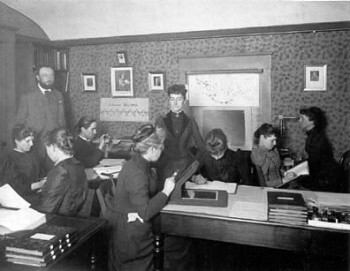 Among these women were graduates of Wellesley and Radcliffe and, 1888, from Vassar, Antonia Maury, whom the authors of The Harvard College Observatory: The First Four Directorships 1839-1919, call "the most original as well as the most elusive personality among the women astronomers in Harvard." When magnified and viewed through one or more prisms, the light from a star appears as a band of colors interspersed with darker lines. Analysis of these spectral lines provides information about the star's temperature, chemical composition, and motion. Antonia Maury's uncle, Henry Draper, had devoted great time and effort to the study of stellar spectra, and he was in the process of cataloging over 100 stars through spectral analysis when he died, in 1882, at the age of 45. Three years later Pickering and Fleming had begun the monumental task at the Harvard College Observatory of cataloguing, according to a color index they had devised, the prismatic spectra of some 10,000 stars. In 1886, Maury's aunt, Anna Draper, who had worked with her husband on his catalogue, had established the Henry Draper Memorial to fund it. Antonia Maury was the "computer" responsible for computing and cataloguing stellar spectra for bright stars in the northern hemisphere, which entailed analyzing thousands of spectral photographs for minute differences. The average pay for the "computers"—sometimes referred to as "Pickering's Harem"—was 25 cents an hour, less than half the amount paid to men. Fleming and one of the "computers," Annie Jump Cannon, had devised an alphabetical system of classification where stars were grouped into seven alphabetical categories. (1) Maury, however, finding several levels of spectral distinction which the Fleming/Cannon scheme didn't recognize, devised her own system—22 groups in a sequence of descending temperature with a concurrent scheme which also classified the spectra by the width and distinctness of the lines; a lines wide and well defined; b were hazy but relatively wide and of the same intensity as a; and c were spectra in which the hydrogen lines and "Orion lines" (now known to be due to helium) were narrow and sharply defined, whereas the calcium lines were more intense. She also had a class ac for stars having characteristics of both a and c.
Maury's efforts to refine the spectral categories were not appreciated. Doing original theoretical work not only conflicted with Pickering's expectations for her as a "computer," but they also slowed down the work on the Draper Catalogue. Her detailed measurements of width and sharpness put him behind schedule. "She was one of the most original thinkers of all the women Pickering employed", Hoffleit notes, "but instead of encouraging her attempts at interpreting observations, he was only irritated by her independence and departure from assigned and expected routine." Frustrated by this constriction of her work, Antonia Maury left Harvard in 1891 to teach in the Gilman School in Cambridge. In 1887, before Maury came to Harvard, Edward Pickering had discovered the spectroscopic double, or binary, star Zeta Ursae Majoris, also know as Mizar. (2) Maury's first task at Harvard had been to determine the orbit of Mizar. In 1889 she independently discovered a second spectroscopic binary, Beta Aurigae, and determined its orbital period. She was the first to calculate the orbits and the periods of revolution of these first two spectroscopic binaries. Pickering announced the achievement on November 13, 1889, at the Philadelphia meeting of the National Academy of Sciences, and in "On the Spectrum of Zeta Ursae Majoris," in the American Journal of Science in 1890, he had noted briefly that "The spectrum of this star has been photographed at the Harvard College Observatory on seventy nights and a careful study of the results has been made by Miss. A. C. Maury, a niece of Dr. Draper." There followed a detailed presentation of the results of that study, with no further mention of Maury. This added slight had weighed on Maury and, when Pickering implored her to return to the Draper project or turn her work over to others, she had written: "I do not think it is fair that I should pass the work into other hands until it can stand as work done by me. I worked out the theory at the cost of much thought and elaborate comparison and I think that I should have full credit for my theory of the relations of the star spectra and also for my theories in regard to Beta Lyrae." She returned to Harvard for a year in 1893 and again in 1895, to complete, using her own classifications, Spectra of Bright Stars Photographed with the 11-inch Draper Telescope as part of the Henry Draper Memorial, which Pickering and she published in1897. (3) The publication's subtitle is Discussed by Antonia C. Maury Under the Direction of Edward C. Pickering. Although Maury's stellar spectra criteria were never adopted for the Harvard project, the Danish astronomer and chemist, Ejnar Hertzsprung, came to recognize their value. Maury had defended her scheme against Pickering's criticism, claiming that the "'c-characteristic'... represented a fundamental property of the stars." In 1905, Hertzsprung published Zur Strahlung der Sterne, a work on stellar magnitudes and luminosities. He distinguished between two types of red star, nearby stars or dwarfs and distant stars or giants. His "red giant" objects were the same stars Maury had catalogued with the "c-characteristic." Hertzsprung declared "In my opinion the separation of Antonia C. Maury of the c- and ac- stars is the most important advancement in stellar classification since the trials by Vogel and Secchi. (4) To neglect the c-properties in solar spectra, I think, is nearly the same thing as if the zoologist, who had detected the deciding differences between a whale and a fish, would continue in classifying them together." By 1913 Hertzsprung and Henry Norris Russell had independently created what is known as the Hertzprung-Russell diagram (HRD), a plot of the absolute magnitude, luminosity, classification, and effective temperature of stars. The HRD's plotting of magnitude and luminosity against temperature is considered the key to modern stellar evolution theory. A subsequent vindication of Maury's insight came in 1922. That year, the International Astronomical Union modified its classification system—derived from Annie Cannon's schema—to include the prefix c-to a certain spectral type defined by narrow and sharp lines. Antonia Maury and her Vassar classmate, Margaretta Palmer (in white), at the 1918 meeting, at Harvard, of the American Astronomical Association. For the rest of her life, Antonia Maury worked only sporadically at Harvard. From 1896 to 1918, she taught physics and chemistry at the Castle School (Miss C.E. Mason's Suburban school for girls) in Tarrytown-on-Hudson, New York. She also delivered lectures on astronomy at Cornell and elsewhere, both to professional audiences and groups of laypersons. She returned to Harvard in 1918 as an adjunct professor. Pickering died in 1919 and Maury found herself able to work better with his successor, Harlow Shapley. Maury did not return to Harvard for over a decade after the publication of her catalog, but she continued to research spectroscopic binary stars. She investigated the complex spectroscopic binary Beta Lyrae over many years, examining nearly 300 spectra of this star. In 1933 she published two studies of three extremely complex binaries in Annals of Harvard College Observatory, volume 64, number 6: "The Spectroscopic Binaries, Mu1 Scorpii and V Puppis" and "The Spectral Changes of Beta Lyrae." She continued to examine the puzzling spectra of Beta Lyrae well beyond her official retirement from Harvard in 1935. In retirement, Maury returned to long-established family interests, emulating her aunt and namesake, Antonia Draper Dixon, in her pursuit of ornithology as well as her father, a noted naturalist and geographer, in her of naturalist and conservationist causes. She fought to save western Sequoia forests when they were endangered by wartime lumber requirements, and she remained a member of the American Astronomical Society, the Royal Astronomical Society, and the National Audubon Society. She also served for three years as curator of the Draper Museum in Hastings-on-Hudson, New York, the family compound where both her grandfather and her uncle had built observatories. Like Miss Cannon, Miss Maury was extremely good to me. Many were the long talks that we had about the problems of stellar spectra. We both like to work at night, and our discussions were painfully punctuated by insect bites, for she insisted on keeping the windows open and could not bear to kill the mosquitoes. Miss Maury was sensitive, imaginative, affectionate, and I feel as if she was a rejected sort of person. I don’t know if anyone had ever shown her much affection…. Nobody had ever listened to her…. She was a woman of great courage and warmth of heart…. Of course, I only knew her when she was old. I was very fond of her, but she just talked and talked and talked and talked. You couldn't do any work because she wanted to talk so much. It was just that she needed an outlet; she needed to discuss. Nobody had ever listened to her, nobody had ever responded to her scientific questionings, I think. There was a profound difference in scientific outlook between her and Miss Cannon. Miss Maury was a dreamer and a poet, always vehemently denouncing injustice, forever battling for a good (often a lost) cause. She had a passion for understanding things. It was typical of her that she devoted years to the mysteries of Beta Lyrae and Upsilon Sagittarii, still incompletely solved…. A late recognition, tinged with irony, came to Antonia Maury, when she received the Annie J. Cannon award of the American Astronomical Society, in 1943, at the age of 77. (5) More recently, the dean of modern stellar astronomers, William Wilson Morgan, who, along with P. C. Keenan and Edith Kellman, developed the MKK system of stellar classification now in use, dedicated the 1978 Revised Spectral Atlas for Stars Larger Than the Sun to "Antonia C. Maury…Master Morphologist of Stellar Spectra," whom he also acclaimed as "for me, the single greatest mind that has ever engaged itself in the field of the morphology of stellar spectra." Antonia Maury, who, surveying the vastness of the known universe, once observed "but the human brain is greater yet, because it can comprehend it all," died in Dobbs Ferry, New York, on January 8, 1952. Stellar spectroscopy had begun, in the late 19th century with 22 categories (A-Q) based on declining strength of the hydrogen lines. As work continued, it became clear that the original, alphabetic classifications were out of order and that some were duplicates, and rather than reclassify each star, the Harvard project refined the categories, producing the difficult to remember order of seven categories: OBAFGKM, which was remembered through the mnemonic "Oh Be A Fine Girl, Kiss Me." This scheme remains in use, although several other mnemonics have evolved, including "Officially, Bill Always Felt Guilty Kissing Monica" and "Only Bored Astronomers Find Gratification Knowing Mnemonics." Binary stars had been observed telescopically since the late 17th century, and the English astronomer, William Herschel, aided by his sister, Caroline, had cataloged hundreds and defined for the first time their gravitational relation by the early 1800s. Spectroscopic binary stars are double stars the components of which are too close together to be seen visually as individuals but which can identified by their spectra of double lines. Pickering and Cannon published a study of the bright stars in the southern hemisphere in 1901, and their work on the Draper Catalogue" itself got under way in 1911. The first part appeared in 1918. Cannon continued the project after Pickering's death in 1919, and the 9 parts of the finished project (1918-1924) cataloged over 225,000 stars. Cannon published a 6-part "extension" (1925-36) covering an additional 46,850 fainter stars, and her cataloging work continued until her death in 1941. The German astronomer, Hermann Carl Vogel (1842-1907), one of the early masters of stellar spectroscopy, showed that the spectroscopic color shift (red shift) was related to the movement of stars towards and away from the earth. The Italian astronomer, Father Pietro Angelo Secchi (1818-1848), a pioneer in stellar spectroscopy, catalogued over 10,000 binaries, and, in 1866, he proposed the five "Secchi classes," the first system of stellar classification based on analysis of absorption lines and the predecessor of the Pickering/Cannon scheme. Exiled briefly from Italy, during the revolution of 1848-49, he studied in Washington DC with Antonia Maury's ancestor, Matthew Fontaine Maury, with whom he corresponded for many years. Cannon, her fellow Harvard "computer," had been appointed to the faculty in 1938, after 44 years at the observatory and at the age of 74. Andrew Fraknoi has compiled a comprehensive web page about women in astronomy.